At least one body is in the wreckage of the plane which disappeared from radar over the English Channel carrying Premier League footballer Emiliano Sala. 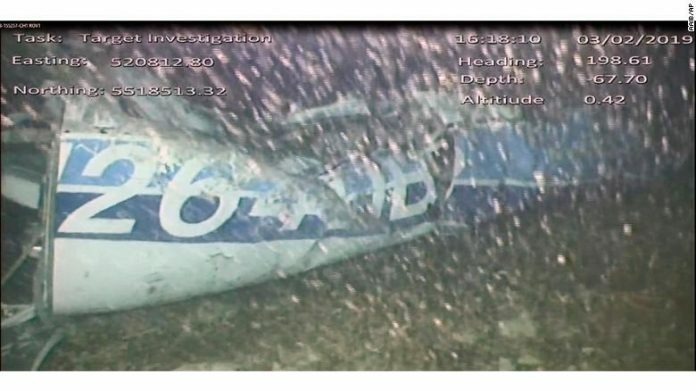 The UK Air Accidents Investigation Branch said footage had been filmed using an underwater remotely-operated vehicle which was surveying the area after the plane was located on Sunday (Monday, NZ time). David Mearns, an American-born shipwreck-hunting specialist leading a privately funded search for the plane on behalf of the Argentinian’s family, announced that the wreckage had been found on Twitter after returning to the island of Guernsey from the search and police informed the families of the two men on board. The Piper Malibu flying plane Cardiff City’s new £15million (NZ$28.44m) striker vanished after hitting bad weather. Sala was being flown on the evening of January 21 from the French city of Nantes to Cardiff after being signed by the Welsh capital’s Premier League team. The main search for the plane was called off after three days, but Sala’s family launched a fundraising initiative that led to Mearns bringing his expertise to the mission. Cardiff signed the 28-year-old Sala from Nantes for a club-record fee on January 19. The striker left Cardiff after signing his deal and returned to Nantes to collect his belongings and say goodbye to team-mates and staff of the French club.